One of the few constants in today's rapidly changing business environment is the requirement for reliable, cost-effective, high-volume printing. 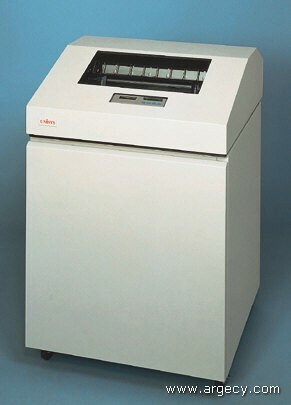 The Unisys Line Matrix Printer family is a feature-rich suite of impact printers, specifically designed for high-volume printing environments. The printers are also versatile, providing a variety of emulations and options for attaching to virtually any system. The Unisys 501/1000/1500 LPM family is available in three configurations - an open pedestal, an enclosed cabinet, or with a stacker. The UMS501 ships in an open pedestal design which minimizes floor space requirements and maximizes access to forms. The UMS1000 and UMS1500 are available either with an acoustical cabinet, or with a power stacker and acoustical cabinet. The acoustical cabinet models provide acoustic levels quieter than many laser printers, making them suitable for nearly all business environments. All of these printers provide dependable impact printing. The Power Stacker, standard on some models, adds improved remote operation capabilities for large unattended print jobs. All models support a wide variety of system printing applications such as invoices, checks, multi-part forms, card stock, listings, reports, labels, and bar codes. Direct network connectivity through an internal Ethernet LAN adapter expands the printer capability to support more users. This option can be configured over the Internet via the adapter's built in web page. The advanced printing features of these printers combined with built-in growth capability and the Unisys guarantee of quality and service give you the line matrix printers of choice for most system printing requirements.